In conjunction with J&J Productions (and by happy coincidence), I am ranking down my Ten Best & Worst Comic Book Movie Castings (though he is going for 25). My Top Five will be found in the podcast I did with James (which was a lot of fun). This therefore will include only my Top Ten, though perhaps I will revisit it in the future. James' list includes heroes and villains, but for the moment I have chosen only heroes. I have a separate Villains List which I will include as a 'bonus' feature later on. Looking over James' list (which is quite good), I'm putting in my own criteria. I based this only on the films themselves, as I don't have a comic book background. I never read comics as a kid and really don't know the difference between DC and Marvel. I based this list on the actual performances, how I reacted to both the performances and characters, and whether I was convinced that they 'were' the characters. For now, let us begin our countdown. I remember giving Man of Steel the mildest, mildest of recommendations, and frankly, this may have to be revisited. Now, the movie itself is pretty bad (far too 'dark' to be a true Superman movie, given Superman has never been brooding in the Batman mode). I know many Man of Steel defenders, but even they seem hard-pressed to think highly of Henry Cavill's performance. I think we should state the obvious: Henry Cavill is a beautiful-looking man. He also as an actor can hit his mark (he wasn't that bad in The Tudors). However, he was dead as both Clark Kent and Kal-El. I don't think he changed his facial expression once in this behemoth of a film. All he did was pose and say words, but his delivery was such it made one wonder whether he learned his lines phonetically. Both Clark and Superman were boring figures, made more boring by the leaden Cavill, who filled out the suit nicely but who couldn't express human (or Kryptonian) emotion to save his life. I think Eric Bana is a good actor, and one would think he would be good as Dr. Bruce Banner aka The Hulk. However, there wasn't a drop of emotion in Bana's performance (something which plagued many on this list). He was burdened by a lousy script (another bane to those on the list), but an actor can make it work. My question after watching Hulk is whether Bana or anyone else wanted to make it work. There's not taking things seriously, and then taking things TOO seriously. Hulk falls squarely in the latter, and is the worse for it. From the very first scene Bana was in, it appeared he wasn't familiar with anything remotely resembling human emotion. He wasn't robotic, he just wasn't there. Bana delivered bad dialogue badly, as if he needed to get the words out of his mouth to make someone, anyone, believe them. Somehow, while Hulk was a horror, Bana was just as horrific. You wouldn't like him when he's angry, we're told. Frankly, we would have liked Eric Bana to have been anything. I was not familiar with Dylan Dog until the movie, which judging by its subtitle Dead of Night was suppose to launch a franchise. However, the movie was just an absolute disaster from beginning to end. Brandon Routh is just one factor of what killed Dylan Dog, but he's a big part of it nonetheless. Routh had this lacquered look on his face, as if he were a waxwork suddenly given mobility. He acted as if he were wax too, with a permanently frozen expression on his face and never reacting to anything going on on-screen. 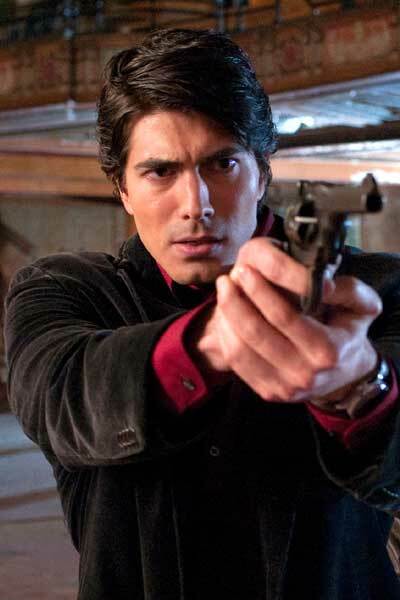 From love scenes to fighting the Devil, it didn't appear to register with Dylan Dog/Brandon Routh. Now, as someone who had defended Routh in Superman Returns (at least the first time), after watching Dylan Dog: Dead of Night, I decided to throw my hands up in the air and declare that Brandon Routh can't act. Like Henry Cavill, Jessica Alba is a beautiful person. There is no debate about that. Like Henry Cavill, however, Jessica Alba can't act, or at least has given little evidence to show she can. Let's get away from the obvious: Jessica Alba was not miscast as Sue Storm because she's Latina (though frankly, even with the blonde wig and contact lenses she's the most unconvincing WASP in the history of cinema). She was miscast because her acting mainly consisted of looking puzzled about everything. When she wasn't puzzled, she was witless (is it a step back that Sue's main fixation in Rise of the Silver Surfer was her wedding?). There was a flustered, highly forced and mannered style to her Invisible Woman, as if rather than being this brilliant mind to match Reed Richards, she was as close to a Latin Bimbo as could be found in Hollywood. I like Alba. I even confess finding Rise of the Silver Surfer to be a guilty pleasure (don't hate). However, Alba had no point in being in either film, and as I think Roger Ebert or my one-sided nemesis Richard Roeper said, why would you make Jessica Alba INVISIBLE? How sad that not only do I have two Superman interpretations on my Worst List (showing that all those that followed Christopher Reeve have never been able to come close to him), but that Brandon Routh makes it on my worst list TWICE! As a side note, I cannot include Tom Welling from Smallville because I only saw one season and thus, I don't think I can put him here yet (though what I saw did not impress me and shows that he too is just a model spouting words). I thought Routh was good as Clark Kent, having this endearing, bumbling manner to him (which put him both closer to the original Superman but have him at least a semblance of emotion). However, as Superman he was disastrous. Blank, uninteresting, boring. Moreover, while he had his moments as Clark he still managed to squash them with robotic delivery. I have as an example when Jimmy Olsen (Sam Worthington) takes Clark drinking and tells the bartender that Clark has been on a spiritual search for five years (even though Jimmy, in fact no one, makes the connection between Clark disappearing for five years and Superman disappearing at the exact same time). The bartender (a cameo by the original Jimmy Olsen, Jack Larson) tells Clark how difficult it must be to come back. "Well, things happen," Routh replies robotically, then we are left with both the bartender and Clark kind of just staring at each other, unsure of what to do. Ultimately, while he was better at least in one role than his successor Henry Cavill, Brandon Routh frankly isn't as pretty. Numbers 5-1 are on the podcast. While I have never disliked Cavill's version of Superman, I suppose I am not a fan either. I ultimately blame Snyder and Goyer for the flat and lifelessness of Man of Steel as a whole. I have not seen The Hulk is quite some time, so I can't really comment on Bana's performance, but I do remember the movie being a disappointment. I have actually not seen Dylan Dog, maybe I should keep it that way. Jessica Alba almost made my Top 5. She is absolutely the wrong choice for role in every way, plus for not being able to act. What Ebert or Roeper said is hilarious! Brandon Routh and Superman Returns is just awful! The movie and his performance is just boring. There are virtually no redeeming qualities of that movie. Great list Rick! And thanks for being on the podcast. We need help dealing with all the stresses of life. And help is there in form of movies. In short, we go to the movies to get a lube, brake check and wheel alignment for our souls.